LANDSCAPE ARCHITECT J. Mark White, President of GardenWise, Inc., had enjoyed a long and congenial history of creating gardens for the homes that architect Rob Morris designed and built. So when the opportunity arose for Morris, of the Arlington,Virginia-based Morris-Day Designers and Builders, to design and build a home for White, he jumped at the chance. Some of those well-crafted details include windows with individual glass panes, thick columns, and substantial exterior trim. By incorporating these details, the focus really is not on the size of the house as much as on the exterior architectural elements and White’s landscaping. The second floor has a master bedroom and bathroom, two bedrooms with access to a hall bathroom, and a guest suite that consists of a bedroom and full bath. Above this is an attic, which is strictly used for storage. The grassy front lawn sweeps up from the street to the house, showing off the surrounding plants, and it is this lawn that is perhaps the most labor-intensive area outdoors, notes White. His back patio is paved with bluestone bordered in Belgian block, as is the walkway in the front of the house. The patio is the spot where, weather permitting, White indulges his passion for entertaining. “The patio is sort of an extension of the house…I do a lot of entertaining and have a gas grill there,” he says. 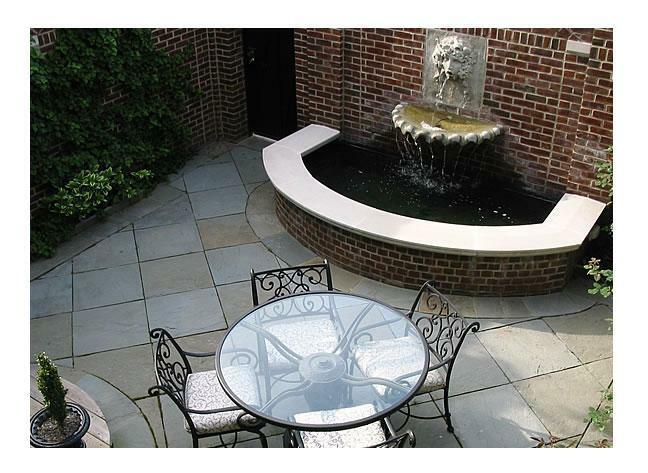 From the patio, a gravel path leads to a round water feature, which is the primary image seen from the house. 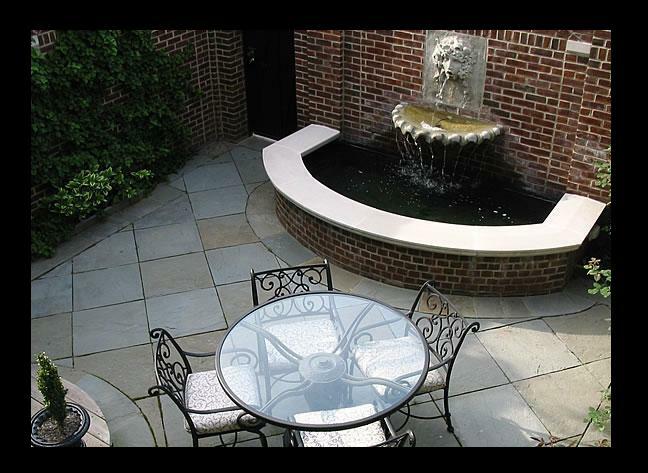 “The water feature is a very traditional caststone basin that spills into a lower pool. I incorporated cobalt blue glass mosaic tiles in the lower basin, giving it a more contemporary edge,” says White. Above: One of White’s signature “cocoon” spaces in Washington, D.C.